ATLANTA, March 28, 2019 — Scuf Gaming, innovator and creator of high-performance gaming controllers, extends its support to the sports gaming community with the release of the Official Controller of the NBA 2K League: the SCUF Vantage NBA2KL. With a sleek design and over 15 unique features, this controller is crafted to quicken reactions and adapt to the playstyle of any gamer, amateur or professional. The SCUF Vantage NBA2KL (starting at $229.95) is now available in Wireless/Wired model for delivery in the US & Canada on scuf.co/NBA2KL. Scuf Gaming®, innovator and creator of high-performance gaming controllers, provides superior accessories and customized gaming controllers for console and PC that are used by top professional gamers as well as casual gamers. Built to specification, SCUF controllers offer a number of functional and design features custom built to increase hand use and improve gameplay. SCUF controller features are covered by 45 granted patents, and another 57 pending, focusing on four key areas of a controller: the back control functions and handles, the trigger control mechanisms, the thumbstick control area and the side-mounted configurable Sax™ button placements. ATLANTA, December 17, 2018 — Scuf Gaming, innovator and creator of high-performance gaming controllers, has entered a partnership agreement as official controller sponsor with Red Reserve, one of the leading professional esports organization. “SCUF Gaming has set the standard for custom controllers for nearly a decade, promoting high level gameplay. These controllers are also essential for reducing excessive and uncomfortable hand movements used in traditional controller holding techniques like ‘clawing’. Our Call of Duty players are long-time users of SCUF controllers so a partnership with them was a no-brainer for us, we’re excited that we can now share the benefits of a SCUF controller with our fan-base.” said Alex Gonzalez, Chief Operations Officer of Red Reserve. Scuf Gaming sponsors the organization’s teams, including Call of Duty, which finished 2nd in last year’s CWL Anaheim. The team of European super-star players recently moved to a team house in Las Vegas and will be competing in the CWL Pro League qualifier starting January 16th. Red Reserve is one of the world’s leading brands in esports and entertainment with professional rosters in a variety of esports titles including Call of Duty (COD) and Counter-Strike: Global Offensive (CS:GO). ATLANTA, November 09, 2018 — Scuf Gaming, innovator and creator of high-performance gaming controllers, is teaming up with the Movember Foundation to use its profile and wide reaching affiliate network to raise awareness for the issues that affect men’s mental health. 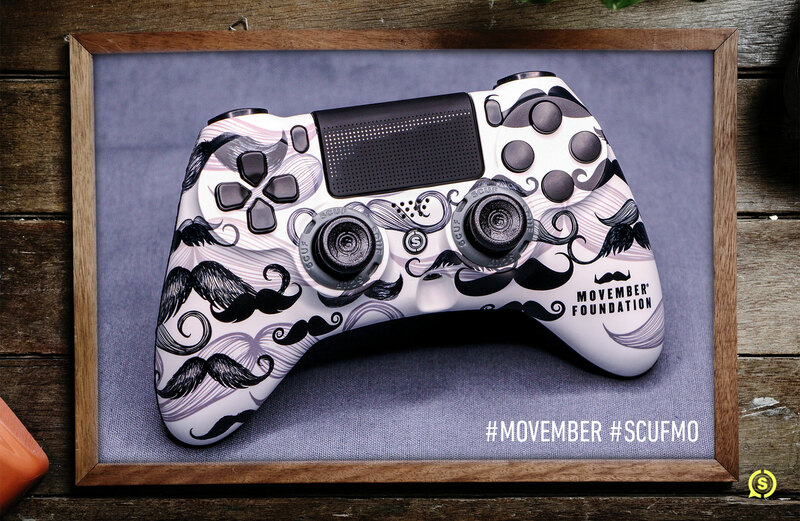 During November, Scuf Gaming will also donate 10 percent of its website sales to the Movember Foundation when customers use the code “MOVEMBER” at purchase. Scuf Gaming will put limited-edition, Movember-themed SCUF Impacts in the hands of partners and influencers to help create visibility and awareness for this cause. The specially designed Movember controllers feature the classic moustache silhouettes that have become synonymous with the Movember Foundation and men’s health awareness. Under the tagline “Share Your Frame of Mind” and via the hashtags “#MOVEMBER” and “#SCUFMO”, influencers and pro-gamers, including Ali-A, CouRage, and OpTic Gaming CEO Hector Rodriguez, will join the fight to bring awareness to these issues, showcasing the Movember-themed SCUF controllers and sharing the Movember Foundation’s message. The Movember Foundation is the leading global charity dedicated to changing the face of men’s health. Its annual campaign encourages men to grow moustaches in the month of November, and year-round they encourage the discussion of men’s health issues including, mental health, prostate cancer, testicular cancer, and suicide prevention. To learn more on Movember, visit www.movember.com, and get involved on social media via the hashtags “#MOVEMBER” and “#SCUFMO”. LONDON, November 8, 2018 — Scuf Gaming, innovator and creator of high-performance gaming controllers, is partnering with acclaimed musician deadmau5 for his latest pop-up experience, lots of stuff in a store, in London’s Soho district from November 11 – 17. At the pop-up event, deadmau5 fans and gamers will have the opportunity to purchase one of the 100 limited-edition SCUF deadmau5 controllers. The new deadmau5 SCUF controller, exclusive to this event, features the signature “mau5head” logo and a unique color scheme. In addition, Scuf Gaming and deadmau5 will offer the opportunity to play deadmau5’s favorite game, PUBG, and other titles at in-store gaming stations. The exclusive deadmau5 SCUF controller will be available for purchase, as supplies last (£212 GBP), at the pop-up event, located on 19-23 Broadwick St. Soho, London. ATLANTA, November 5, 2018 — Scuf Gaming®, innovator and creator of high-performance gaming controllers, through its patent subsidiary Ironburg Inventions, has expanded its global patent portfolio, bringing the company’s total number of patents to 45, with an additional 5 pending patent applications approved and ready to issue, and 52 additional pending applications. The SCUF Vantage™, the company’s most recent and advanced PS4™ controller, relies on existing Scuf Gaming® intellectual property, such as remappable back control functions, interchangeable thumbsticks and trigger control mechanisms. It also features innovations never before seen in a controller, such as the Sax™ buttons (removable side action buttons), which permit mid-finger activation of game functions and removable vibration modules to quickly select vibration and weight preferences. 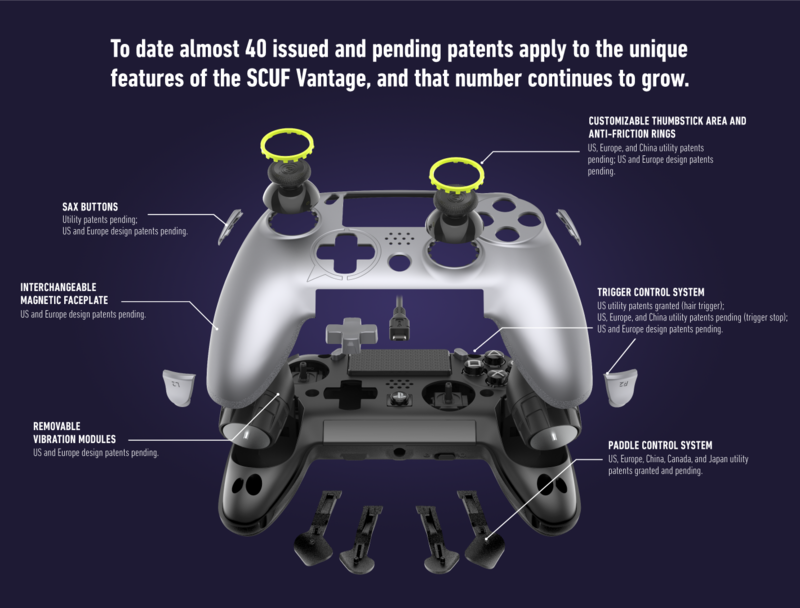 The SCUF Vantage™ has almost 40 granted or pending patents covering its unique features, and that number continues to grow. Scuf Gaming® continues to obtain intellectual property protection for the features that increase user hand use and enhance performance through the customization of thumbsticks, triggers, and buttons as well as the look and feel of its controllers. S. Patent 9,878,238: Directed to paddle technology used in the SCUF Vantage™ controller. European Patent 32427: Directed to rapid change thumbsticks. Canadian Patent 2913093: Directed to paddle technology used in the SCUF Vantage™ controller. European Patent 3102301: Directed to magnetic remapping technology. In 2015, Scuf Gaming licensed their IP to Microsoft to create the Xbox Elite controller. Scuf Gaming continues to invest many millions of dollars into R&D and their patent portfolio, and actively defends their intellectual property to protect their assets and many employees worldwide. To learn more about Scuf Gaming’s® intellectual property, please visit scufgaming.com/patents. For additional information about Scuf Gaming, please follow us on Twitter, Facebook, Instagram, YouTube, Twitch, or Snapchat. ATLANTA, November 02, 2018 — Scuf Gaming, innovator and creator of high-performance gaming controllers continues its partnership with American rock band Avenged Sevenfold and releases the SCUF Vantage Avenged. The controller features iconic designs from the band’s globally recognized artwork, and continues Scuf’s multi-year collaboration with the acclaimed musicians and gamers. Music from the Grammy-nominated heavy metal band Avenged Sevenfold —whose first SCUF controller design debuted in 2013— has had their music featured in each of the four installments of Call of Duty: Black Ops, all of which has been collected in the EP “Black Reign”, available now. Lead vocalist M. Shadows is an avid Call of Duty® player and has been using SCUF controllers since early 2012. The SCUF Vantage Avenged Sevenfold design mirrors the slick style that frequents Avenged Sevenfold’s album covers and merchandise. It features a black background and glossy silver imagery which compliments the silver triggers, D-Pad, and Sax buttons. 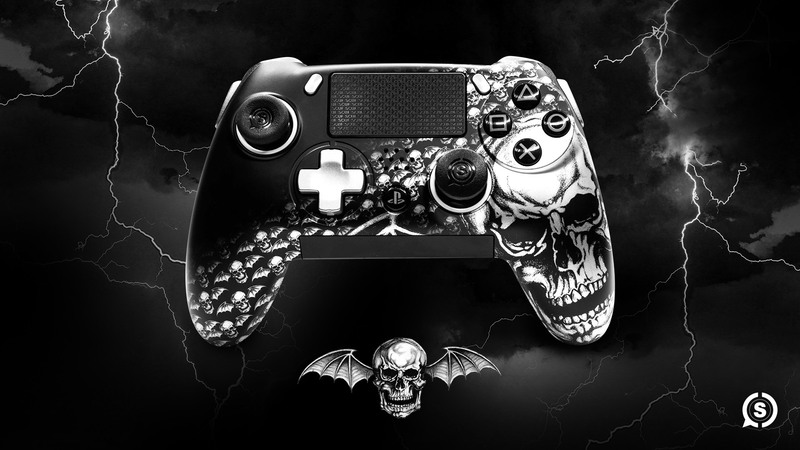 Each SCUF Vantage Avenged Sevenfold controller comes equipped with a suite of configurable components, including the paddle control system, unique side-mounted Sax buttons, advanced audio touch bar controls, a quick-access remapping switch, customizable thumbsticks, hair trigger, trigger stops and extenders, choice of D-pads, and an interchangeable magnetic faceplate, all designed to increase hand use and deliver a significant performance improvement. For more information on the SCUF Vantage Avenged Sevenfold, please visit scufgaming.com/avenged. Scuf Gaming®, innovator and creator of high-performance gaming controllers, provides superior accessories and customized gaming controllers for console and PC that are used by top professional gamers as well as casual gamers. Built to specification, SCUF controllers offer a number of functional and design features custom built to increase hand use and improve gameplay. SCUF controller features are covered by 42 granted patents, and another 60+ pending, protecting four key areas of a controller: the back control functions and handles, the trigger control mechanisms, the thumbstick control area and the side-mounted configurable Sax button placements. In case you missed it, Scuf Gaming officially launched a brand-new Gaming House in France last week with a giant bash to welcome its new residents: famed professional gamer Corentin “Gotaga” Houssein and gamer, rapper, and style extraordinaire Amine “PrimeTimeFUT” Mekri, who will live stream, make music, and play games for their millions of fans. Situated in a historic Paris neighborhood, the stunning SCUF House France provides the ultimate living experience for its guests, complete with three terraces, an indoor swimming pool, a private bar, and a movie theater. Most importantly, the house includes dedicated areas for content creation, including a custom-built streaming room for Gotaga, a music studio for Prime, and a streaming station with room for five additional guests. Finally, as part of the SCUF House France grand opening, a newly re-designed Gotaga SCUF controller has been launched featuring his iconic color palette and branding. Meanwhile, a new Prime-inspired SCUF controller design was also revealed and will be available soon. Gotaga, a Red Bull athlete and long-standing partner of Scuf Gaming since 2014, is one of the most prominent players in the world, and an icon in French gaming with a YouTube Channel that boasts over 2.6 million subscribers and a Twitch stream with 1.2 million followers. Gotaga’s videos highlight his high level of skill and entertaining personality. They feature family members and friends from the world of professional gaming and content creation. During his career as a professional gamer, Gotaga has played for numerous leading European teams and has attended three Call of Duty Championships. He also organizes the Gotaga Barrière Show, a private gaming event that benefits children’s hospitals. Prime has grown his fame as a popular streamer and gamer to launch a career as a musician and fashion designer. He has performed before tens of thousands of fans, including at the historic Bataclan. Follow SCUF Gaming France, Gotaga, and Prime for more content from the SCUF Gaming House! Happy National Video Games Day from us at Team SCUF! It’s no surprise that we’re passionate about gaming here at SCUF, so to celebrate this very special day we asked a few of our staff to share a few words about some of their favorite games of all time. My favorite game in the last 10 years would have to be Fortnite. I’ve always been attracted to the looter games like Fallout and Destiny, but the Battle Royale genre really opened up the experience even further for me. I instantly fell in love with the combination of looting, shooting and especially building, since I’ve been building my own houses and bases in games like The Sims and Command & Conquer. Being able to squad up with your friends or just go in solo is everything I’ve been wanting to play for a long time, and the feeling you get when you are actually the last man standing is a feeling that no other game can give you. That is why Fortnite is my favorite game. Call of Duty: Modern Warfare remains one of the best video games of all-time for me due to its exciting gameplay, memorable storyline and revolutionary multiplayer. I remember playing missions like “All Ghillied Up” for the first time and comparing the extremely tense tones and muted color palette to a movie. With each whispered order, Captain MacMillan guides you through each careful step of the mission, which is then brought to a crescendo as you take aim at your target, Imran Zakhaev, from the hotel vantage point. This mission and many others like it have become fond memories for myself and many other people that played this game. Bloodborne is probably the game that I have devoted the most time to playing in recent memory. From its Lovecraftian setting to player community, this game really hit all the sweet spots for me. I appreciate how environments can keep surprising the player with layers of over-the-top Victorian-meets-Gothic architecture which ooze with unease across one giant map. As things begin to change, you notice just how wrong the city of Yharnam truly is as you stack your “insight” fighting grotesque beasts and exploring a city that keeps even the most well-traveled areas interesting on later visits. The trick weapon system allows for a surprisingly deep combat system with varying playstyles that made both the PvE and PvP of the game exciting and fast-paced. Even after playing through the game a few times and mastering some boss fights, I always found something to bring me back in. What can I say about the first Black Ops that has not already been said? The game was a masterpiece in many cases and, in my opinion, was Call of Duty’s greatest in its history. The campaign was mind-blowing, while the online multiplayer introduced many soon-to-be iconic maps. However, Zombies was really the knockout hook from out of nowhere. The mode was already pretty popular by that time but Black Ops perfected it. The amount of time I spent playing on Kino Der Toten with my buddies was insane. This game shaped my taste for future online shooters. Honestly, to this day, I hold the current games my friends and I play to the standard of the original Call of Duty: Black Ops.